Last week when I was in Colorado, thanks to the magic of Twitter, I was able to get together with a couple of designer/author/crocheter/knitter friends for dinner. What a treat! 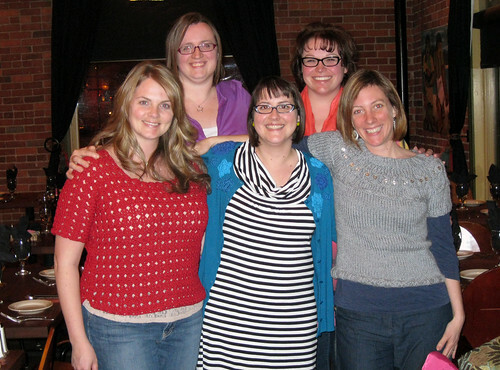 It was like a miniature version of the designer dinner that Marlaina put together for us at TNNA. But the cutest part was that both Marly Bird (aka Yarn Thing, aka the co-author of Curvy Crochet) and Joanna Johnson (who you might know from her adorable books for children–with knitting!) both brought their media copies of Little Crochet , for me to sign! I was so touched! My friends and family are all great at being excited for me, but real live knitters and crocheters getting excited? Well, that just made my night. I also got to meet some of Marly’s Minions (my loving nickname for the people who help her crochet and knit her samples)–Jolene is in the back row and Jenni is the one sporting a pretty red sweater (Marly’s design). And the really nice thing about the dinner + the photos? I still had my professionally applied makeup on from the day of filming. Trust me, I usually don’t look this good, but maybe I should start trying! I didn't know you know Marly :) She's my knitting & crochet teacher! Sounds like a fun time. And I love what everyone is wearing!